out when you read the manual (or in this case, watch the DVD). Yes, yes, I know – reading the manual is a Code Violation, but I was far from the shed, so felt it was justified. I was watching the DVD that came with the Tormek T7 (from Carroll’s), and had one of those “duh” moments. The packaging that the accessories came in had a washer in each corner, and I didn’t click what they were for (and I’m betting it is already dawning on you because I’ve specifically mentioned them). The packaging wasn’t just to look good when you opened the box, but could be then screwed to the wall as a convenient storage. In the storage, there is the book and DVD, below that honing paste. On the right side, top to bottom is the brand new square/straight edge jig (more on that in a sec), diamond truing tool and angle master. On the right is the wheel dressing stone. The straight-edge jig has been significantly reworked/redesigned, so you can no longer overtighten/misalign/twist the chisel causing it to inadvertently become a skew. I can testify it works very well (and yes, I’ve created my share of skew chisels with the old style (Triton in my case) holder. A suggestion made recently about using the Torque with the copy attachment to duplicate a tool holder would work very well here, especially to create a storage unit that could also hold the other sharpening jigs I have. Thinking it just a little further, the technique used a day or so in duplicating the kangaroo might work well here. Like any tool, the Domino can definitely benefit from jigs, and Festool have produced some to add to the capabilities of the basic machine. The Additional Stop provides extra support for the Domino when used vertically. It screws directly into the base of the Domino. It is particularly useful when cutting mortises near the edge of a thin board, where the mitre fence has very little support on the edge of the thin board. The Additional Stop has flip-up indexing to provide additional indexing in from the edge of the board. Occasionally you need additional range for precise indexing from an edge of the project. The Cross Stops connect to the Domino with a dovetail connector and cam latch. The indexing points can be moved along the length of the arms, with a v groove edge to assist consistent placement. Unfortunately the two raised portions are not movable, and deal only with stock between 35 and 60mm diameter. I’m thinking of ways of getting to manage smaller diameter dowels, but it seems a pity the jig needs customisation. All these jigs (except the Handrail Fence) come in the Domino Kit from Ideal Tools, or can be purchased individually as required. Just been putting together the bits n pieces I will need in Brisbane over the weekend for the Timber and Working with Wood Show. Spent about 1/2 the day in the shed making some jigs to take, and got most of what I wanted done. Got to try out the single roller MagFence on the bandsaw for resawing, and I was very impressed. Not only with the MagFence itself which worked perfectly, but also how much easier having a single point of contact fence made resawing. I was slicing veneers that were under 1mm without any problem at all. So a successful day, and plenty of new things tried as well. One slight hiccup – I contacted the airline because their documentation said something about magnets, and despite these not being strong (relative to a magnetron, or what they quote as “a strong magnet”), I can’t take any MagSwitches with me, even if they are switched off. You can post them (airmail), but not fly with them yourself, even in checked baggage. Anyway, I best stop mucking around on the computer and get some rest – have to be up at 4am to get to the airport! As I mentioned, I was in Carbatec the other day as I was after some CA Accelerator. As I was wandering out of the store, I was surprised to find I had still made a purchase – not sure how that happened! Hmm – weird. At least my chisels and gouges will be happy! 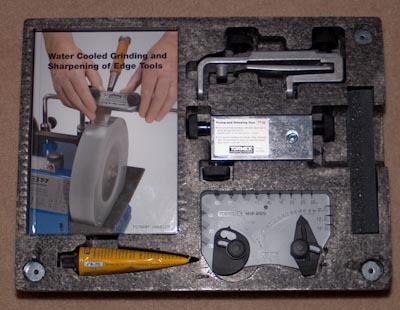 The wetstone sharpeners are just one part of the system – the jigs that are available make it a very versatile machine. This video covers both some of the jigs that are available, as well as dressing the stone, so it is flat and parallel to the jig support arm. Triton Project Plans / Free Project Plans! The Triton Mk3 Project Book is no longer commercially available, so Triton have released the projects from that book as PDFs. Despite being written for the Mk3, they are still very suitable for WC2000 owners (and are just good projects for non-Triton users as well).